A Sketch Challenge~Any size layout. I have a very simple 12 x 12 layout to share with you. The papers are from a Valentine paper pack that I picked up at Michael's a while back and really needed to use it up. I cut 2 strips of coordinating pattern paper for on each side of the layout. I also added some fun ric rac ribbon. My hearts are cut out at 2.25 x 2.45 from Gypsy Wondering cartridge and then layered the other hearts that I cut out of the pattern paper from this pack and pop dotted them on it. I cut the layered photo mat at 5 x 5 1/2 and another one at 5 1/4 x 5 3/4. I tied a pretty satin bow and a cute little charm that says.....Be Mine! The Celebrate Love is cut from Calligraphy Collection at 2.88 x 4.70 and created a shadow layer at 3.00 x 4.89. 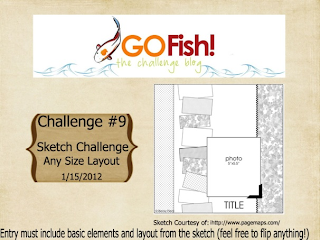 I hope you stop over at Go Fish Challenge Blog and check out the other Design Team Members and their projects. You are sure to be inspired:) Remember you have 2 weeks to link up your entry:) Hope you come join us! Super lay-out! Love all the hearts! This layout is so pretty! I love all the layers you added to the hearts. Beautiful! This looks Awesome! Welcome to the team again my friend. great interpretation of the sketch. congrats on your first "fishy" DT post. This is gorgeous! I love the shiney paper and all the hearts! Pretty hearts and shiny papers, great layout too. This is just an adorable Valinetine Card! Really LOVE your papers, especially the shiny heart paper in the backgound. Just a great take on the sketch. Thanks for joining my Valentines giveaway and becoming a new follower! I am now following you and love your blog! Great layout! The shiny heart paper is fabulous - and looks just super with the cut hearts that you've added. Congratulations again on your new design spot! Oh Sherrie, this is so cute! I am going to have to do a go fish challenge because I do everything you do! lol! Very shimmery and elegant, Sherrie! The sketch looks great. I hope I have time to play along; this is a great sketch. Beautiful layout, so shiney and pretty!! !